Sometimes things happen. The can of compressed air got mixed up with the can for liquid carpet cleaner, and like that the keyboard on our Lenovo G450 laptop went kaput. Pressing a single key would result in multiple characters showing up on the screen. I tried prying the key caps up and cleaning the area with alcohol to no effect. It was time for a replacement. 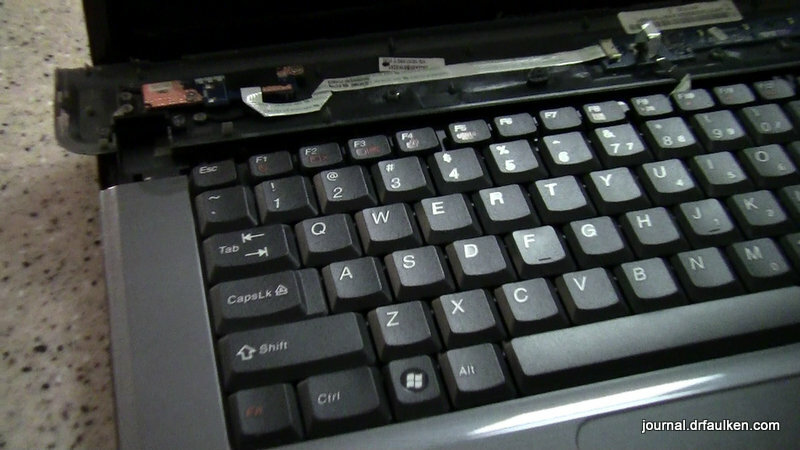 Luckily, the keyboard used on the G450 is shared by many Lenovo laptops, and is very inexpensive. I paid $13 shipped from a seller in eBay (who may or may not have already sold me a replacement keyboard – cough). Four business days later, I was ready to start the replacement surgery. The first time I replaced the keyboard I pried up the bottom fascia before realizing this was the wrong way to do it. There are two screws that hold the keyboard down, and they are accessible by removing the very small, easily serviced top fascia. Snap snap snap, two screws, replace the control ribbon, tighten the screws, snap snap snap and it’s over. That being said, I didn’t want an opportunity to shoot a YouTube video to pass me by, so here’s how to replace the keyboard on a Lenovo G450 laptop.